Started in 1997 by the Late Jeff Coggins (Tennbow) a bunch of fine, upstanding (cough!) 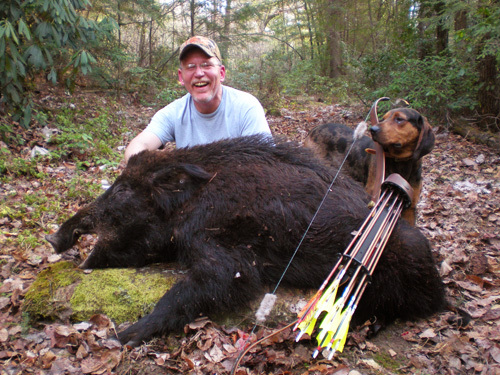 Bowsite citizens have been getting together at Ken Moody's place (Clarkrange Hunting Lodge) to chase wild boar with dogs around Ken's 1000 acres. Since Jeff's passing, Roger Yenn (Tradtech) continues this tradition today. This was my 3rd MHH and I brought my son Pat Jr. along this time around. 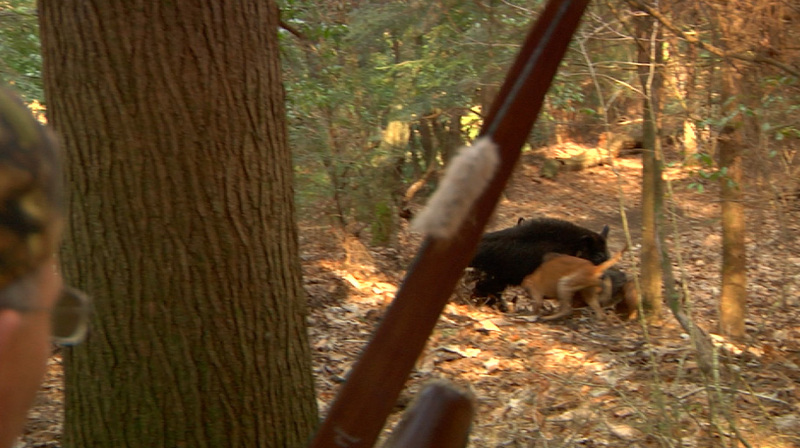 The hunt is just good clean redneck fun - chasing hogs with hounds and bows. 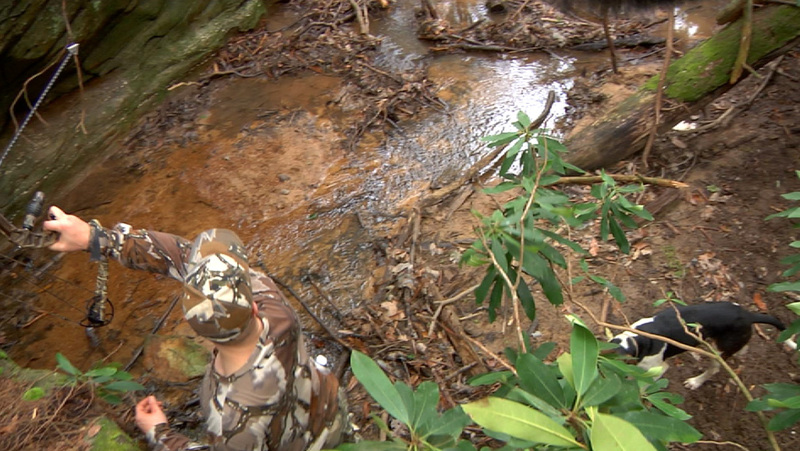 There were 19 bowhunters this year and this feature will bring you through the two days experienced within my group of hunters including Brian Barzee, Roger Yenn, Nick Sink, Pat Lefemine Jr. and yours truly. 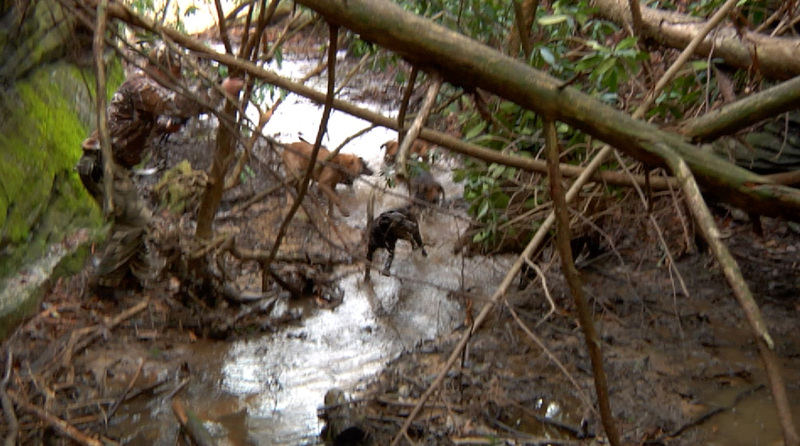 What an absolute blast and if you need to blow off steam during the late winter doldrums this is the ticket! Brian was the first shooter from our group on Saturday morning. 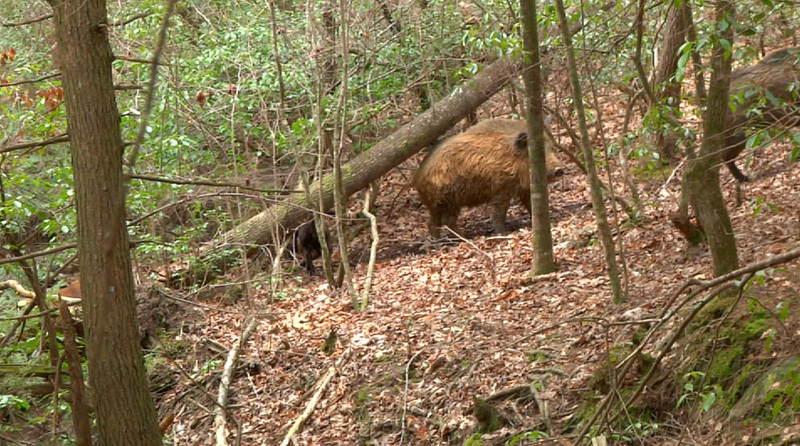 A large group of hogs were bayed right off the bat and it made getting a shot difficult. 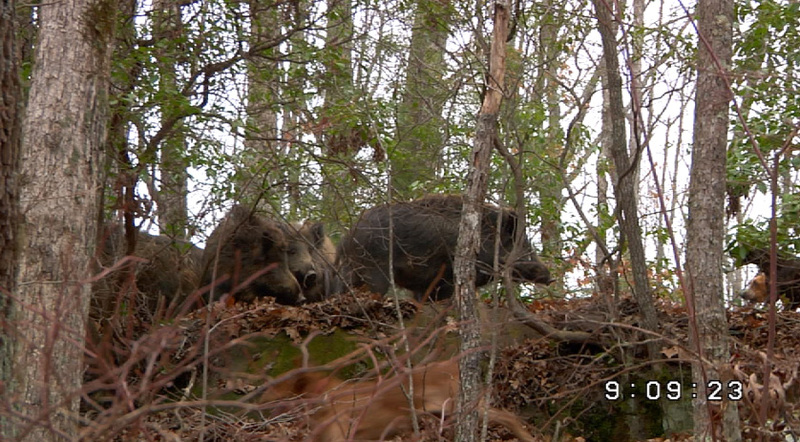 This group ran us all over the place but eventually we caught up to one single hog and Brian made a terrific shot! 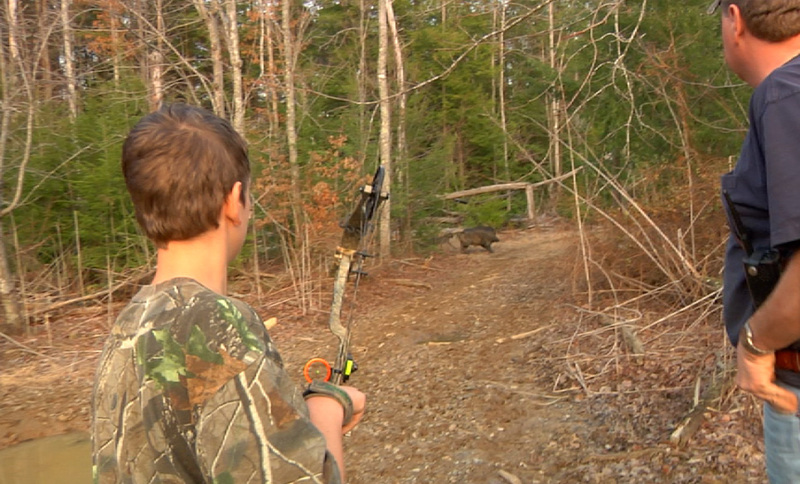 Nick is 12 and this was his first hunt. 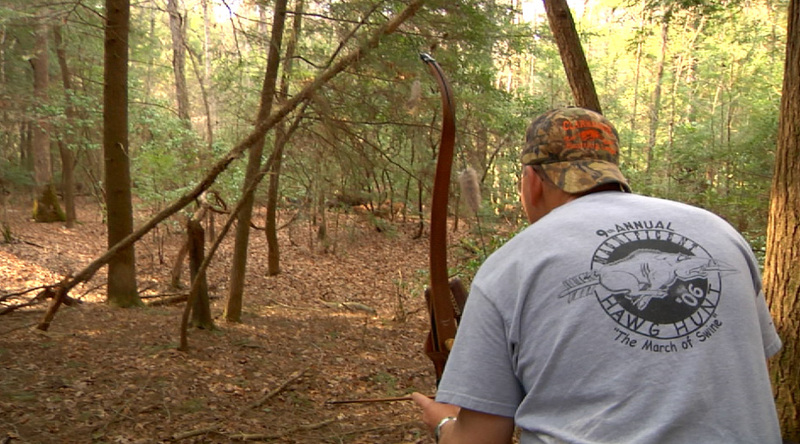 He had been practicing for weeks in preparation of this hunt and it really showed. 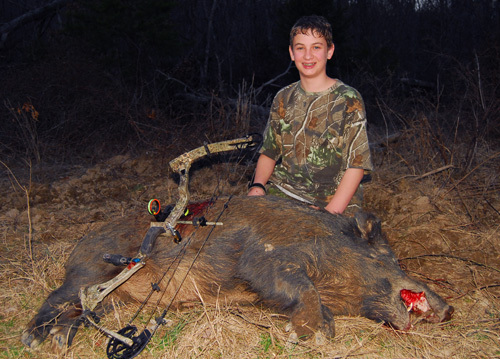 He made some great shots on a tough old hog and collected his first trophy boar! 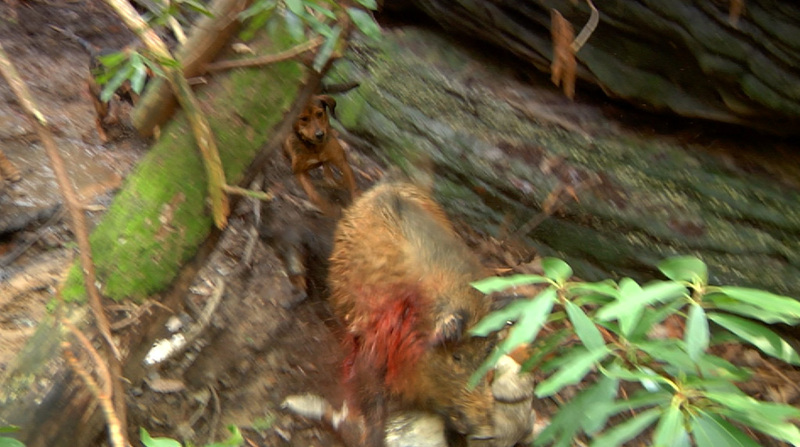 Everyone was very proud of Nick and glad to be part of his first kill. We all wondered if Roger was ever going to shoot his damned bow! 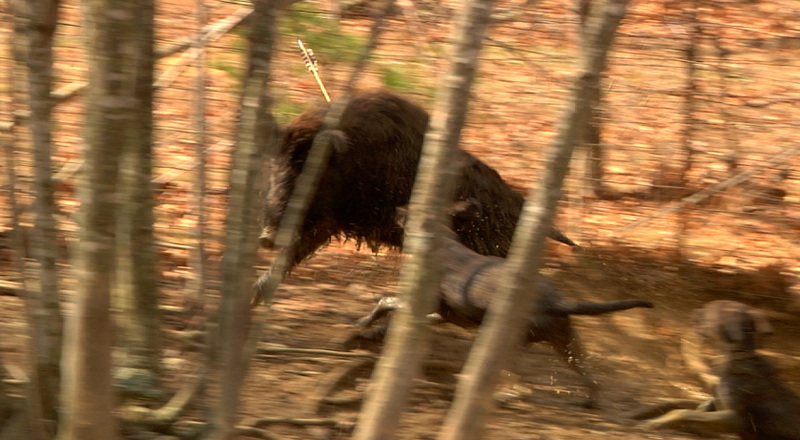 But when the dogs bayed this huge old boar the green light went on and Roger dumped the string. 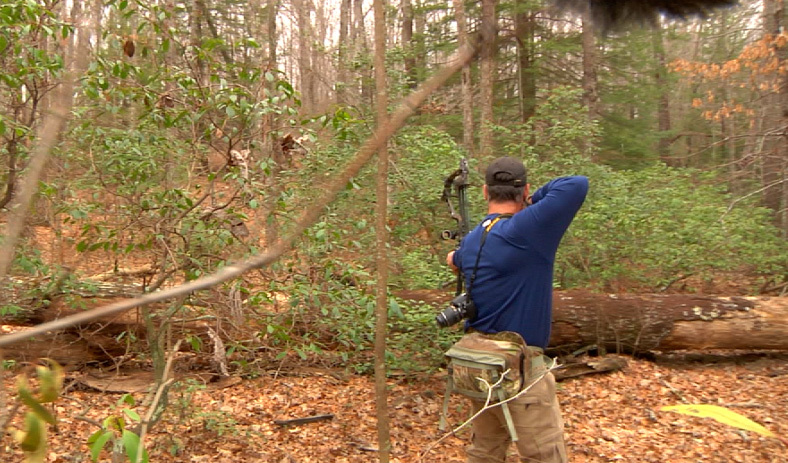 The first shot deflected and the second shot was right on the money! 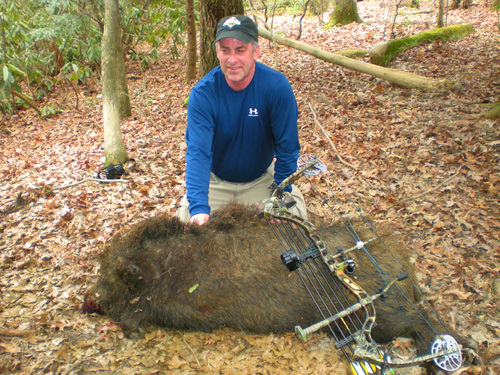 A huge boar for Mr. Yenn. 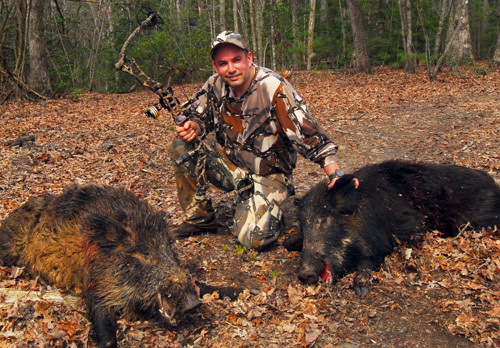 This was Pat Jr's first time at Clarkrange and his 3rd hog hunt. 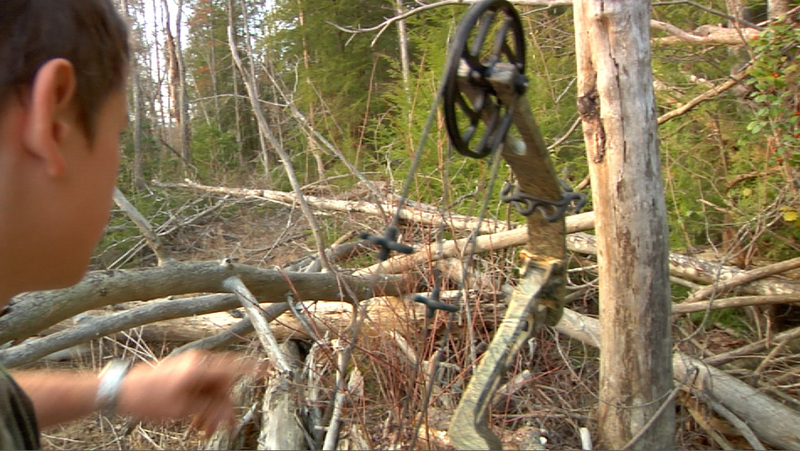 His first shot was off and the video showed why; his arrow had fallen off the rest when he shot. 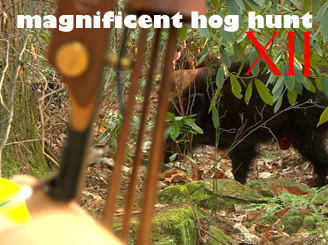 But the boar gave him a 2nd opportunity and he hammered it with a perfect double lung hit. Pat Jr. took home a huge ram and dad was quite proud. 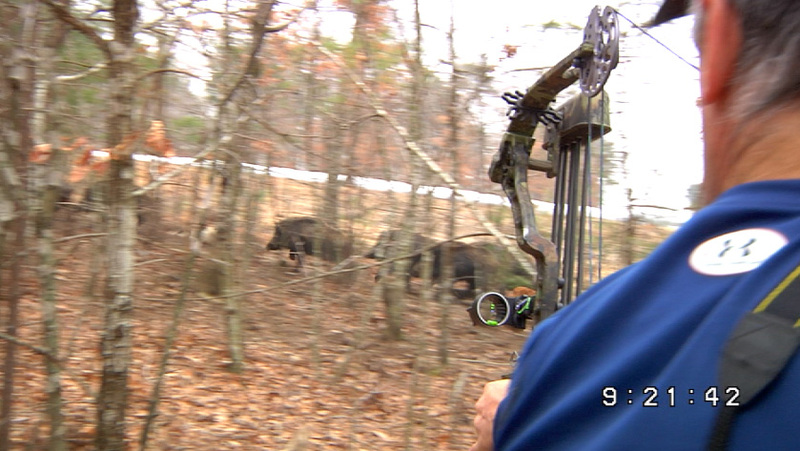 Come Sunday morning I was the only bowhunter left without a hog. 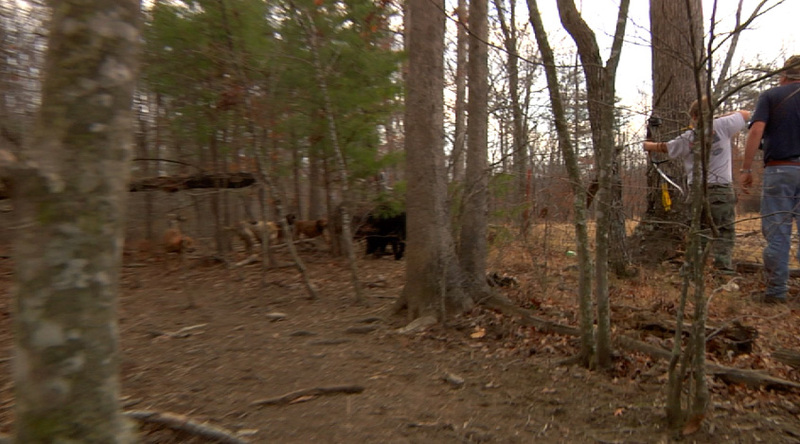 We had a tough time getting on them at first, they were running around like crazy. 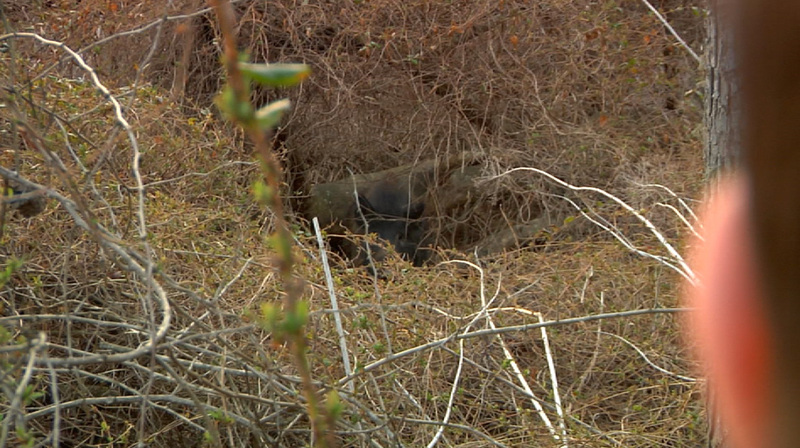 But eventually one bayed in some very thick laurels and I had to thread the needle right into the hogs lungs. 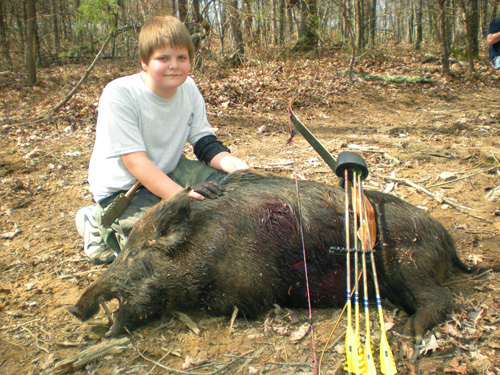 A dandy Hog!